A guy named Wesley just posted four questions he had about employer sponsored RFID implantation on my RFID Toys book forum. They were good questions, so I decided to post his questions and my response here on my blog. program for microchips to be wrong? 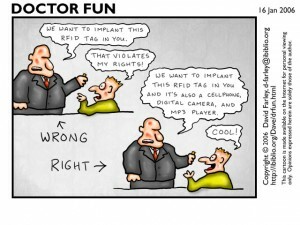 from your broad perspective on RFID and security? activities, or have they in the past? I’ll assume your questions are aimed specifically at RFID implants, not RFID access cards or inventory control systems. 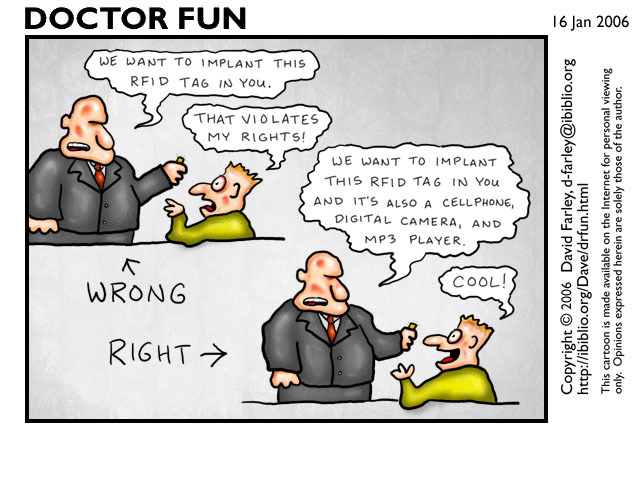 1) I think a volunteer program for RFID use (implants or otherwise) is a perfectly acceptable, as long as there is an overabundance (not just an “adequate” amount) of information pertaining to the risks to personal health, privacy, and potential security and liability risks. Quite often in any volunteer program (not just RFID implantation) the program is laid out with the expectation that the would-be volunteer will do all the appropriate research before volunteering… however many times there is a deliberate effort to under-inform potential volunteers. It is the organization’s job to provide all applicable information to potential volunteers, including possible risks, then remind the volunteers that they should do additional research on their own. The company should also be very clear and up front about its liability policy and waivers, and use that reminder as leverage to ensure that potential volunteers are taking full personal responsibility for their actions should they decide to sign a waiver and volunteer. That will help insulate the company from any potential future lawsuits from people that claim “they had no idea what they were getting into”. That said, because the only legal FDA approved RFID implantation procedure uses the VeriChip, which is implanted deep in the arm tissue and is designed to be permanent (removal is very difficult, painful, and expensive)… I would never suggest to anyone they get a VeriChip implant. 2) The only advantage I can see for an employer to have employees who are implanted with a VeriChip would be negligible compared to deploying access key cards or using RFID enabled security badges. The only advantage would be a much lower cost of managing lost RFID key cards. There are some disadvantages however to urging employees to get a VeriChip implant. At this time, the VeriChip implant employs no security features what-so-ever, and is actually less secure than a security enabled access card. Even though the majority of commercial building access cards employ no security measures, there is at least an easy option to change out these security cards with new cards. On the other hand, upgrading a VeriChip implant is a major medical procedure… more so than simply having it injected. That is definitely not something I would undergo for my employer. 3) I think its less cost effective for a company to pay for implantation because the VeriChip implant procedure costs about $200 per person, while access cards for even the most expensive systems run about $11. An employee would have to lose 19 access cards to equate the cost of a single implant procedure. However, when it comes to managing lost access cards, there is a time savings there, but not much. Employees rarely lose access cards, and deactivating one card and activating and handing out a new one only takes a few minutes. 4) My implants are not FDA approved, are not VeriChip implants, and are not located in my arm. For me, the implants I have in each hand have helped expedite my daily activities, particularly in entering my home. Starting my motorcycle is also quite handy, and logging into my computer is helpful from time to time… but unlocking my home is the one activity I use my implant for every single day, and it is the one thing I really ever cared about in the first place, so I’m happy. I think the people getting the greatest value from RFID implantation, at this point in time anyway, is the home hobbyist. Sure, there are people you hear about from time to time that get their VeriChip read at a hospital emergency room… but those cases are few compared to the hundreds of home brew DIY people that are now using RFID implants in their own projects every single day. This entry was posted on Friday, October 9th, 2009 at 9:26 am	and is filed under Adventures in RFID. You can follow any responses to this entry through the RSS 2.0 feed. You can leave a response, or trackback from your own site.